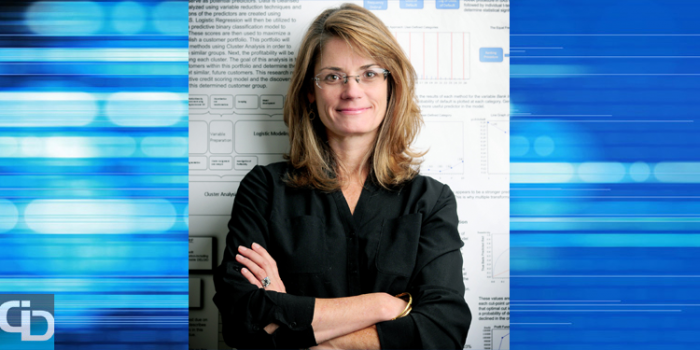 Jennifer Lewis Priestley is Professor of Statistics and Data Science at Kennesaw State University. icrunchdata speaks with business leaders about the progression of their careers in analytics, what they are focusing on in their current roles and their interests outside of data. We recently spoke to Jennifer Lewis Priestley about her role and the progressive Ph.D. program in Analytics and Data Science at Kennesaw State University. Tell us when and how you landed your role at Kennesaw State University. This is actually a second career for me. I graduated from Penn State in 1991 with an MBA and a concentration in Statistics. Early in my career I worked for AT&T in New York and New Jersey, and then worked for Andersen Consulting based in Atlanta, but really flying all over the country. I moved to London in 1997, taking a job with VISA EU. In that position, I worked closely with the Scottish and Irish banks as they transitioned their consumer loan products from primarily debit cards to more profitable credit cards. Every week, I was flying from London to Edinburgh, Dublin or San Francisco. While this sounds exciting, the reality was quite different. After a few years at this pace, I was exhausted. By the age of 30, I had over a million frequent flier miles. In 2000, I moved back to the United States – to Atlanta – and decided to quit. Cold turkey. So I hung up my silk suits and my leather brief case, and pulled out my blue jeans and my backpack, and at the age of 33 I went back to school and completed my Ph.D. in Decision Sciences (an early pre-cursor to Data Science). I interviewed with a few universities in the Atlanta area – all of which were excellent schools – but I was incredibly impressed with my discussions at Kennesaw State University. From the first conversation, there was a clear fit – they were actively seeking people who bridged the gap between academia and the private sector… people who could do theoretical research, but had also engaged in practical application… most of the Statistics faculty had all studied different applications of mathematics, but importantly we all had actually applied our skills outside the classroom in deep and meaningful ways. I should also note that after speaking with several other schools, I was blown away by the positive energy, the momentum and the excitement at KSU…they were on such an explosive trajectory. At that point, the university had about 18,000 students, a few graduate programs, but it was primarily an undergraduate institution. Today, KSU has more than 33,000 students and nearly 150 different undergraduate and graduate degree programs. KSU is now one of the 50 largest public institutions in the nation. How has your role evolved in the past year? I came to KSU in 2004 (incredible to think that I have now been here 12 years!). I began as an assistant professor in Mathematics, teaching applied statistics. At that time, there were no STAT courses…statistics was just another course taught out of the Department of Mathematics. In 2006, I helped to launch our MS in Applied Statistics and our undergraduate minor in Applied Statistics. In many ways, both of these programs were “Data Science” programs – we just did not recognize the term at that time. I say “Data Science” programs, because both programs really integrated the core concepts of programming, mathematics, and applied statistics using REAL data sets from REAL companies (we are fortunate to be just north of Atlanta which is the national or regional headquarters for dozens of Fortune 500 companies). Everything we did (and do) was (is) grounded in Base SAS programming, SQL and R.
Shortly after their launch, both of those programs became two of the most successful programs in the history of the university – the MS in Applied Statistics has a 100% placement rate with most students having multiple offers well in advance of graduation, and the undergraduate Minor in Applied Statistics and Data Analysis enrolls about 200 students every semester. I was honored to have an opportunity to teach courses in both of those programs. In the last year, most of my attention has been focused on the development and launch (care and feeding) of the Ph.D. program in Analytics and Data Science. Nearly one year ago, Kennesaw State University became the first university in Georgia – and one of the few in the country – to offer a Ph.D. in advanced analytics and data science. How is the program structured? What are the primary disciplines? The program is both traditional and innovative…both applied and theoretical. Basically…it’s a Ph.D. for the 21st century. The curriculum sits at the intersection of the Department of Mathematics, the Department of Statistics and Analytical Sciences and the Department of Computer Science. The general structure of the program is heavy course work in years 1-2, project and research work in year 3 and dissertation and scholarship in year 4. What type of student do you see flourishing most in the program? The Ph.D. in Data Science bridges the gap between theory and application. Because of this unique dimension, the students who come into the program are both theoretical researchers and practitioners – and frequently both simultaneously. In our program, about half of the Ph.D. students are planning to go into academia and the other half are planning to enter the private sector. But increasingly I receive requests from people who intend to do both – work in the private sector while simultaneously maintaining an affiliation with a university. In terms of backgrounds, we see students from the obvious disciplines – Statistics, Mathematics, Computer Science, information Systems…but we also see students from Engineering and Computational Disciplines – like Finance, Economics, etc. I have also found that students need an “X” factor. This is an innate curiosity to find out “why”…combined with a tenacity to follow an analytical thread until they understand “why.” I can’t put my finger on exactly how to articulate it, but I know it when I see it. It’s a singularly focused curiosity, combined with creativity and perseverance. Tell us about a win for you or the program recently. I am glad that you asked. Here are a few. We were honored in 2014 by ComputerWorld as having one of the most innovative Big Data programs in the country. I was the Chair of the SAS National Analytics Conference in 2015. We are running about seven applications per funded slot in our Ph.D. program…and I get to do cool interviews like this. What gets you most excited about where data science education is heading? I think Data Science education should be part of every general education curriculum in every university in the country. Data is not going away. In fact its becoming more ubiquitous. My opinion is that along with the core skills related to reading, writing, basic science…we should be requiring students to learn basic data analysis skills – understand how data is captured and stored…how to extract and load…how to do simple calculations like averages and medians…and how to create meaningful visualizations. These skills are applicable to EVERY major…to EVERY field of study. It’s a “horizontal” set of skills…like writing or problem solving. And we don’t have to wait until college. At the K-12 level, we can integrate basic analytical skills into the curriculum to help bring scientific concepts to life – collect some data on how the plants are growing…then test which kind of plant food worked best. It seems as if early introduction to analytical concepts would make the STEAM disciplines more approachable and more interesting…and increase the probability that they would consider a STEAM major in college. Which program, person, or brand impresses you more than anyone else in the field? The company that impresses me the most is SAS – they are constantly reinventing themselves in a highly dynamic and shifting marketplace. They continue to offer products and services that redefine and transform the data science landscape. Rather than “compete” with languages like R and Python, they integrate with them through products and services that allow their customers to get the most out of both…Just like Phrygian Gordium and Alexander the Great, SAS is slicing the Gordian Knot by changing the field…and making versions of their software free, providing resources, holding meetups, users groups and conferences for those who use their products. I think people who regularly write SAS’s obituary, don’t know SAS. Is there a quote or motto that you live by? “Don’t let your heart be troubled.” I find that things are rarely as bad as they initially seem. Is there something most people don’t know about you? In my free time I read two genres of literature. One is Catholic Theology. I attended Catholic school as a child, and did everything I could to NOT read Catholic theology. As an adult, I appreciate the themes at a depth I could not as a child. My favorite authors are Thomas Merton, Richard John Neuhaus and RR Reno (who is also the editor of the only periodical that I receive – First Things. Check it out). The second is presidential biographies. I have read a biography on almost every president (William Henry Harrison was only president for 32 days – not much there). I enjoy reading these biographies because I find that I learn a lot of history in context. In addition, you really begin to understand that most of these men were the product of their character and their circumstance. They rose to the challenges of their day, but most were not any more or less “great” than you or me. What’s the most memorable book, story or movie you’ve encountered recently? What was your take away? I recently read “Tobit’s Dog” by Michael Nicholas Richard. The story is a retelling of the Book of Tobit (part of the biblical Apocrypha) in depression-era Appalachia. The author writes in the style of a modern-day Flannery O’Connor – using the integration of biblical themes into the stories of poverty and racial relations in the Deep South. “Tobit’s Dog” provided me a deep and meaningful experience of the themes of family lineage, materialism and the importance of children…and it reminds me that these themes are not new…they have been present for mankind for millennia…just in different forms. If you could tell a younger version of yourself one thing, what would you say? Where did you go to college and what do you remember most about your time there? I did my undergraduate work at Georgia Tech. The intensity of the workload was nothing I had every previously experienced…it was truly academic Darwinism at its best. I think to let off steam I probably went a little off the deep end – I used to skydive on the weekends. If you had to reduce all your physical possessions to a single backpack, what would you fit in there? My AmEx card, my phone (with charger), my passport and three books – “Death on a Friday Afternoon” by Richard John Neuhaus, “The Seven Story Mountain” by Thomas Merton and “Ethics” by Dietrich Bonhoeffer. What are you going to do right after this interview? Binge watch the Sopranos. I just started Season 3 (don’t tell my students…it might make them nervous). That's all for now. Stay tuned for Part 2 of this Exclusive Interview with Jennifer Lewis Priestley.